I am currently studying the signaling of Protein Kinase D in cardiomyocytes as a part of my senior thesis research project. Writing this review helped me understand the known mechanisms and the techniques used to perform functional assessments of the molecule. I learned how to review literature to find key information and create a story from different sources. I hope that the reader will become interested in one of the major concepts of my review and will continue exploring it on their own time. Heart failure (HF) is a leading cause of death in the U.S. population (American Heart Association). HF is defined by structural and functional impairments of the heart muscle that may be caused by chronic neurohormonal stimulation . A common precursors to HF is cardiac hypertrophy, which is characterized by increased cell size, reorganization of sarcomere structure, and reactivation of fetal genes–all contributing to pathogenic cardiac remodeling . Although many treatments exist, this condition is associated with poor prognosis, low quality of life and frequent hospital readmissions . Low cardiac output is an early sign of heart failure that triggers the renin-angiotensin-aldosterone system (RAAS) as a compensatory mechanism to increase the fluid volume. Although the cardiac output is temporarily increased, chronic angiotensin II and aldosterone as well as sympathetic nervous system stimulation eventually result in fluid overload. This paradox contributes to accumulation of damage to the cardiovascular system, which may ultimately result in myocardial ischemia, hypertrophy, and arrhythmia . The RAAS is a key regulator in the cardiovascular system and its role in conditions such as hypertension, cardiac hypertrophy, and atherosclerosis is well established. Components of the RAAS are known biomarkers of HF and are targeted therapeutically with ACE inhibitors, angiotensin, mineralocorticoid, and aldosterone receptor antagonists . The RAAS is a major endocrine-paracrine system that regulates vasoconstriction (via angiotensin II) and salt-water balance (via aldosterone). The activation cascade is initiated with renin, an enzyme produced in the juxtaglomerular cells of the kidney in response to decreased systemic volume and low renal perfusion pressure. Angiotensinogen is a precursor produced in the liver and is cleaved by renin to form angiotensin I. The angiotensin-converting enzyme (ACE) cleaves angiotensin I into angiotensin II, promoting the secretion of aldosterone from the adrenal gland. Angiotensin II is locally produced in the heart, which may exacerbate heart failure symptoms in patients with activated RAAS . Aldosterone increases the permeability of the kidney to sodium, thereby increasing retention of salt and water in the body. Several studies have recently suggested a role for Protein Kinase D (PKD), a regulator of cardiac hypertrophy, in modulating the RAAS. PKD is a stress responsive kinase that belongs to the Ca2+/calmodulin-dependent kinases (CaMKII) superfamily. CaMKIIs play a role in calcium handling and excitation-contraction coupling in the cardiomyocytes. There are 3 known isoforms of PKD, of which PKD1 is most highly expressed in the heart . PKD affects a wide array of cellular processes including contractility, survival, proliferation and differentiation, actin dynamics, substrate utilization and gene transcription. PKD1 has also been linked to pathological cardiac remodeling, immune regulation, angiogenesis and cancer . There has been growing evidence of PKD1’s involvement in heart failure. Harrison et al. identified that suppression of PKD1 activity in cardiomyocytes results in a decrease of hypertrophic responses such as reduction in cell size and expression of fetal markers, while constitutive expression exhibits ventricular chamber dilation, wall thinning, and enlargement of the atria. PKD1 phosphorylation has been observed in response to pressure overload, consistent with the cardiac hypertrophy model. Additional evidence from the same study suggests that mice with cardiac-specific PKD1 knockout (cPKD1 KO) are resistant to hypertrophy and fibrosis after induced thoracic aortic constriction, which involves surgical occlusion of the aorta to induce HF . PKD1 expression is upregulated in rabbit HF and in patients with dilated cardiomyopathy. PKD1 may be interacting with nuclear-localized class II histone deacetylases (HDACs) that regulate re-expression of fetal genes leading to hypertrophy . Under stress the heart alters its metabolism leading to increased utilization of carbohydrate substrates, similar to conditions before birth. After birth, the heart takes on the adult isoform, primarily utilizing energy from fatty acid oxidation. To meet the demands of hypertrophy conditions, alternative metabolism genes, also known as fetal genes, become expressed ultimately leading to cardiac remodeling or reversion to a fetal state. Genome-wide association studies look at correlations between single nucleotide polymorphisms (SNPs) or mutations and disease. A recent study pointed to SNPs in PRKD1, PKD1 gene, that are associated with elevated BMI and obesity. Further studies confirmed truncations in PRKD1 in patients with autosomal recessive truncus arteriosus, a congenital heart condition where the aorta and pulmonary artery are fused disrupting the appropriate blood flow. Spontaneous deletions in the gene are also associated with abnormal cardiac physiology . 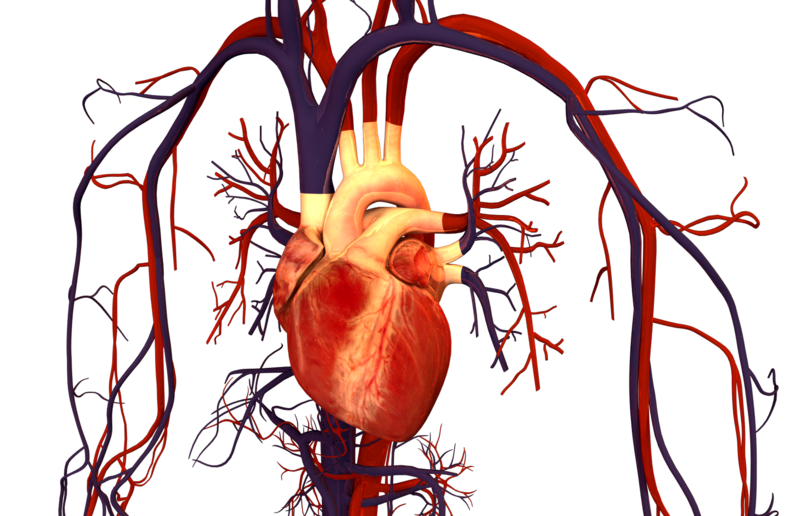 Patients harboring nonsense mutations in PRKD1 are also linked to congenital heart defects . These findings are not surprising since PRKD1-/- results in embryonic lethality , suggesting that mutations in the gene may result in aberrant cardiac development. Angiotensin II activates PKD1 through G-protein coupled receptors (GPCR) residing on the cell’s membrane, which allows it to interact with downstream cardiac ion channels . Prolonged stimulation with angiotensin II may result in hypertrophy. Cardiac-specific PKD1 knockout prevented hypertrophy after treatment with angiotensin II . PKD1 is also known to assemble with Protein Kinase C (PKC) and translocate the Z-disks of the cardiac sarcomeres in response to angiotensin II. Z-disk protein assembly comprises a sarcomere unit that is crucial for the structure maintenance, signal transduction , and is likely involved in transmitting pro hypertrophic signals . Chronic exposure to aldosterone is associated with cardiac fibrosis (Brilla et al.). PKD1 is activated by aldosterone in mice, while treatment with aldosterone inhibitors prevents hypertrophy, pointing to the its involvement in profibrotic responses . Additional studies demonstrate aldosterone-mediated PKD1 activation through mineralcoid receptors in the kidney . and angiotensin II-mediated aldosterone secretion through constitutively active PKD1 signaling in adrenal cells . Despite the recent advancements in cardiovascular medicine, novel molecular targets are necessary to precisely treat the underlying causes of HF. Although PKD seems to be heavily involved in HF, there are currently no direct treatments that target this kinase. Further studies of PKD activity in the heart may uncover new therapeutic targets that could be better alternatives to conventional RAAS inhibitors. While PKD has been an actively researched molecule, its precise activity in different subcellular compartments and pathogenic signaling remains to be fully understood. Future studies may pave the way for further development of anti-fibrotic and hypertrophic treatments that inhibit the angiotensin II-aldosterone dynamics. Dassanayaka, Sujith, and Steven P. Jones. “Recent Developments in Heart Failure.” Circulation Research, vol. 117, no. 7, 2015, pp. 58–63. doi:10.1161/circresaha.115.305765. Mehta, Paresh A., et al. “Mode of Death in Patients with Newly Diagnosed Heart Failure in the General Population.” European Journal of Heart Failure, vol. 10, no. 11, 2008, pp. 1108–1116. doi:10.1016/j.ejheart.2008.09.004. Chaggar, Parminder S., et al. “Neuroendocrine Effects on the Heart and Targets for Therapeutic Manipulation in Heart Failure.” Cardiovascular Therapeutics, vol. 27, no. 3, 2009, pp. 187–193. doi:10.1111/j.1755-5922.2009.00094.x. Wollert, KC. “The Renin–Angiotensin System and Experimental Heart Failure.” Cardiovascular Research, vol. 43, no. 4, 1999, pp. 838–849. doi:10.1016/s0008-6363(99)00145-5. Manning, G. “The Protein Kinase Complement of the Human Genome.” Science, vol. 298, no. 5600, 2002, pp. 1912–1934. doi:10.1126/science.1075762. Wang, Qiming J. “PKD at the Crossroads of DAG and PKC Signaling.” Trends in Pharmacological Sciences, vol. 27, no. 6, 2006, pp. 317–323. doi:10.1016/j.tips.2006.04.003. Rozengurt, Enrique, et al. “Protein Kinase D Signaling.” Journal of Biological Chemistry, vol. 280, no. 14, 2005, pp. 13205–13208. doi:10.1074/jbc.r500002200. Steinberg, S. F. “Regulation of Protein Kinase D1 Activity.” Molecular Pharmacology, vol. 81, no. 3, 2011, pp. 284–291. doi:10.1124/mol.111.075986. Fielitz, J., et al. “Requirement of Protein Kinase D1 for Pathological Cardiac Remodeling.” Proceedings of the National Academy of Sciences, vol. 105, no. 8, 2008, pp. 3059–3063. doi:10.1073/pnas.0712265105. Backs, Johannes, and Eric N. Olson. “Control of Cardiac Growth by Histone Acetylation/Deacetylation.” Circulation Research, vol. 98, no. 1, 2006, pp. 15–24. doi:10.1161/01.res.0000197782.21444.8f. Harrison, B. C., et al. “Regulation of Cardiac Stress Signaling by Protein Kinase D1.” Molecular and Cellular Biology, vol. 26, no. 10, 2006, pp. 3875–3888. doi:10.1128/mcb.26.10.3875-3888.2006. Shaheen, Ranad, et al. “Positional Mapping of PRKD1, NRP1 an dPRDM1as Novel Candidate Disease Genes in Truncus Arteriosus.” Journal of Medical Genetics, vol. 52, no. 5, 2015, pp. 322–329. doi:10.1136/jmedgenet-2015-102992. Rozengurt, Enrique. “Regulation and Function of Protein Kinase D Signaling.” Protein Kinase C in Cancer Signaling and Therapy, 2010, pp. 117–154. doi:10.1007/978-1-60761-543-9_7. Clark, Kathleen A., et al. “Striated Muscle Cytoarchitecture: An Intricate Web of Form and Function.” Annual Review of Cell and Developmental Biology, vol. 18, no. 1, 2002, pp. 637–706. doi:10.1146/annurev.cellbio.18.012502.105840. Knöll, Ralph, et al. “Cardiac Mechanotransduction and Implications for Heart Disease.” Journal of Molecular Medicine, vol. 81, no. 12, 2003, pp. 750–756. doi:10.1007/s00109-003-0488-x. Tsybouleva, Natalia, et al. “Aldosterone, Through Novel Signaling Proteins, Is a Fundamental Molecular Bridge Between the Genetic Defect and the Cardiac Phenotype of Hypertrophic Cardiomyopathy.” Circulation, vol. 109, no. 10, 2004, pp. 1284–1291., doi:10.1161/01.cir.0000121426.43044.2b. Mceneaney, Victoria, et al. “Aldosterone Rapidly Activates Protein Kinase D via a Mineralocorticoid Receptor/EGFR Trans-Activation Pathway in the M1 Kidney CCD Cell Line.” The Journal of Steroid Biochemistry and Molecular Biology, vol. 107, no. 3-5, 2007, pp. 180–190. doi:10.1016/j.jsbmb.2007.03.043. Romero, Damian G., et al. “Angiotensin II-Mediated Protein Kinase D Activation Stimulates Aldosterone and Cortisol Secretion in H295R Human Adrenocortical Cells.” Endocrinology, vol. 147, no. 12, 2006, pp. 6046–6055. doi:10.1210/en.2006-0794. Iwata, Miki, et al. “PKCε–PKD1 Signaling Complex at Z-Discs Plays a Pivotal Role in the Cardiac Hypertrophy Induced by G-Protein Coupling Receptor Agonists.” Biochemical and Biophysical Research Communications, vol. 327, no. 4, 2005, pp. 1105–1113. doi:10.1016/j.bbrc.2004.12.128.